Backlight Function: I’ve never been much for metal detecting at night, but if your nugget or treasure hunting activities extend beyond daytime hours, the “GPX 4500’s” backlight function allows you to read the LCD menu/readout in total darkness. Threshold Stabilizer: Essentially the “GPX 4500’s” threshold stabilizer acts as a fine tuning function that allows you to exercise full control over the machine’s threshold stability. The threshold stabilizer is part of the audio processing circuit and is probably best utilized with the “GPX 4500’s” audio option. All you have to do is adjust the threshold stabilizer control to hear very faint target signals. Those of you out there who are experienced nugget hunters know how important this can be in recovering those smaller gold nuggets or deeply buried pieces of gold. Additionally, if you have any difficulties with hearing loss (as I have) this function can be an additional asset. Advanced Discrimination: I mentioned the “GPX 4500’s” Hi-Trash discriminator function in Part 1. The Hi-Trash mode is only one part of the advanced discrimination features of a machine that essentially allows you to work even the “trashiest” ground. In most other metal detectors using high discrimination or solitary iron reject functions also limits your ability to detect good targets, especially the smaller ones. However, you can actually adjust the desired level of rejection within the “GPX 4500’s iron discriminate mode” using settings that run the range from cautious to aggressive. In highly trashy areas like many old mining sites this can really facilitate detecting and locating nuggets . Additionally, artifact and general treasure hunters can also make great use of this “custom” iron rejection feature. Smart Electronic Timing Alignment: SETA is Minelab’s copyrighted electronic timing function system that I briefly mentioned in Part 1 of this series of posts. The “GPX 4500’s” SETA provides a range of sophisticated precision timing options that minimize magnetic interference, help stabilize the threshold signal, and reduce circuitry shifts and “overloads” from areas containing highly mineralized soils or “hot” rocks. In the greatest sense, SETA allows you to work in just about any soil condition that you encounter out in the field out. That's it for now. Good luck and good hunting to one and all. 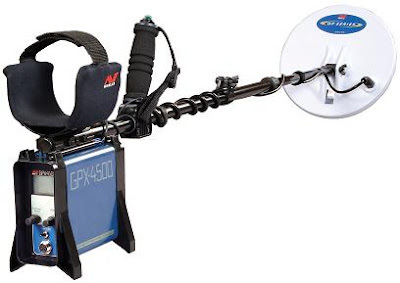 If you liked this post, you may want to read: “Gold Detector Reviews: Minelab’s GPX 4500” (Part 1)"